As the winds of change flow in today, I find myself in the Valley of the Winds, deep within the domed rock formations of Kata Tjuta, also known as the The Olgas. Located about 25kms west of Uluru, this group of domed rocks is connected to the geology of Uluru with both these ancient landmarks dating to around 600 million years ago. Kata Tjuta is spectacular in its own right and holds a very different energy. While Uluru is a single monolithic rock formation, Kata Tjuta consists of 36 domed rocks with narrow chasms opening out to wide valleys. And with recent rains, the Valley of the Winds was alive with native grasses, wildflowers, small creeks and a waterfall. But the energy of the place is not only in the landscape but also in the enormous rocks themselves. 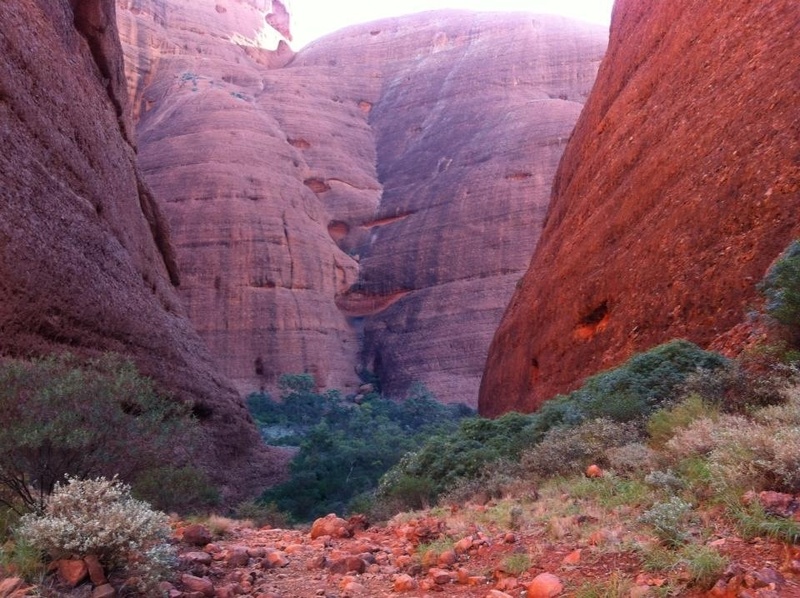 Towering around the perimeter of the valley, the scale of the rocks is incredible as they enclose and protect while their red ochre surfaces reflect a soft pink glow in the afternoon light. Kata Tjuta is a sensitive Men’s site for the local indigenous people and yet the energy there today was of the Feminine. From the wispy clouds dancing overhead to the curved forms of the domes themselves, there was a tangible energy of Love emanating from these formations and they were ready to greet with their friendly smiles, kisses and intertwining forms. I entered the valley around the time of the Lunar Eclipse and as the colour of the rocks deepened and the pink light grew stronger, my Heart energy began to rise. The energy forms in these rocks were vivid and towards the end of the rocky path a wise old face appeared. The influx of energies coming through this Eclipse were centred on healing our relationships and it would seem it’s not only relationships with people but also our connection with Mother Earth. Gaia and all the energies surrounding her are reaching out and it felt as if past, present and future could all come together in this one very special place.